2. Notch the circle (like cutting a wedge of pie) so you can access the basket at the center. 3. Construct the exterior wall about 3 feet high using rocks, metal, timbers or any material that can support the weight of wet soil. 4. Use wire mesh to create a tube about 1 foot in diameter and about 4 feet high. Stand the tube in the center of the circle. 5. 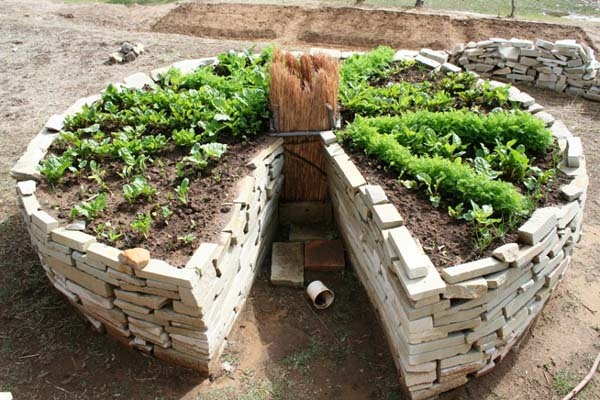 Line the outer walls with cardboard and fill the garden area (but not the wire mesh tube in the center), with layers of compostable materials, wetting it down as you go. Fill the last few inches with compost or potting soil. The soil should slope from a high point at the top of the center basket downward to the edges of the garden. 6. Fill the center basket with alternating layers of compostable material, along with layers of kitchen scraps and herbaceous weeds that provide the plants with moisture and nutrients. 7. Water the center basket and the garden only when the plants will not survive without it. This forces the plants' roots down toward the center basket. 8. Feed the garden by adding more kitchen scraps, lawn clippings, etc., to the center basket. 9. Consider arching a framework of thin wires over the garden. During the hottest months, the wires can support a shade cloth, and in winter, plastic sheeting creates an instant greenhouse. 10. Enjoy the fruits (and vegetables) of your labor. drowning, he threw her the flowers, crying, "vergiss mein nicht". ("forget-me not"). - from the book 100 Flowers and how they got their names - by Diana Wells. You don't need to watch the nightly weather forecast on your local television station to know that there is a chill in the air. Plants feel it, too, and like people, need to bundle up for the winter. Mulching is one of the best lines of defense for perennial plants against chilling temperatures. Mulching also can prevent the repeated freezing and thawing of soil that causes plants to "heave" out of the ground. But the trick is not to mulch too soon. Mulching needs to be done after the ground starts to freeze but before the first significant snowfall of the year. If you mulch sooner, mice and other rodents may nest in the mulch, and plants may not be completely dormant. In general, the end of November is a good time to apply mulch in Vermont although if an early snowstorm is predicted, you may want to apply mulch before it hits. Apply a layer at least three to four inches thick around each plant. After you've laid it down, gently pull it away from the trunks and stems to give plants room to breathe. This helps prevent disease problems. Deeper mulching may be necessary in especially cold or windy sites. In the garden, there's still time to finish fall clean up, removing stakes, string, and plastic as well as fibrous vines and stems and rotting vegetables. This is also a good time to have your soil tested, so you'll be all set to go next spring. Late fall is not a good time to add fertilizer to the garden. That's because nutrients would be lost through leaching or erosion before plants can use them next spring. However, you could get your com- posted manure delivered for next season. Be sure to cover it with plastic to keep nutrients from leaching out over the winter. Like ornamental plants, strawberries benefit from mulch protection, especially when snow cover is shallow or non-existent during winter. Clean straw is superior to hay as mulch because it doesn't add weed seeds to the garden. Apply three to five inches after a hard frost and the strawberry leaves are lying flat on the ground, usually mid to late Novem-ber, to protect crowns and roots against cold injury and drying out. Other activities for November: pot and force tulip bulbs for winter bloom; prune raspberry bushes; start paper-whites in late November for Christmas flowering. tight fitting lids, sprinkle in 2 teaspoons of coarse salt and 2 teaspoons of orris root powder (you can find these at the local health food store). Put the mixture in sealed jars in a dark cupboard for 3 weeks. Mix all the dry ingredients in a bowl, sprinkle in the essential oils, and place in a room away from direct sunlight. Stir occasionally to allow the fragrance of the potpourri to perfume the room. Enjoy!